We don’t give much thought to parking lots or how we drive in them. 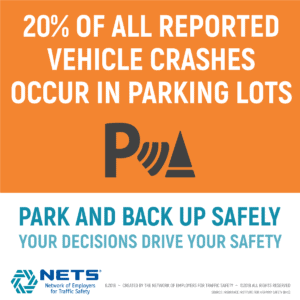 However, according to the Insurance Institute for Highway Safety (IIHS), 20% of all reported vehicle crashes occur in parking lots. Because these collisions often do not result in injuries, many go unreported—so the real number is most likely much higher. And still, there are many such crashes that do involve injury or death. The April 2018 National Highway Traffic Safety Administration (NHTSA) Traffic Safety Facts Report shows some sobering statistics with an estimated 95,000 people injured and an estimated 2,125 people were killed in crashes that occurred in “non-traffic” areas such as parking lots and driveways. It is Drive Safely Work Week™ (DSWW), an annual campaign sponsored by the Network of Employers for Traffic Safety (NETS). It focuses on “changing specific behaviors” and the 2018 emphasis is on parking and backing safely. Encourage drivers to perform a vehicle walk-around to check for any obstacles including vehicles, poles and children, before exiting a parking spot. Once a driver has completed this inspection and ascertained that the area is clear, a prompt and careful exit will help ensure safety. Whenever possible, have drivers back into parking spaces or pull through so that they can exit forward. In angled parking spaces or other circumstances where backing in is not recommended, consider having drivers tap the horn twice before backing out of a parking spot to alert anyone nearby. Establish a training program to help your drivers refine their skills and develop good habits. “Drivers must be equipped with the knowledge and technical capabilities to make real-time decisions…” says David Braunstein, Together for Safer Roads, President. A cloud-based telematics solution can help you monitor driver behavior in parking lots and on the road, especially when paired with dash cams and other auxiliary equipment. If you know what your drivers are doing, you will have better knowledge of what training they need. Keep a positive focus on the goals of improved safety and better on-time performance instead of being punitive toward bad behaviors. 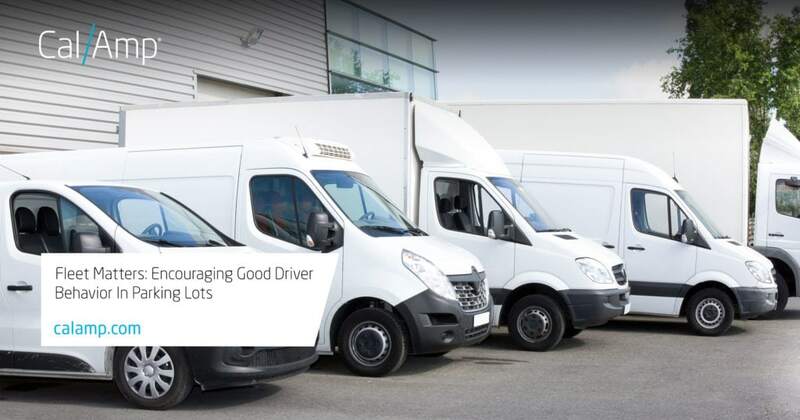 A fleet management system can help you use telematics data effectively by providing a high-level view of the fleet as a whole and letting you drill down into details for a specific vehicle. You can set geozones and alerts that help you monitor when drivers arrive at common stop areas such as supply depots. Alerts can also notify you of bad driver behavior such as hard braking or acceleration events. Since many incidents remain unreported, it might be wise to subscribe to a solution that notifies you when a crash occurs, such as CrashBoxx™ with Instant Crash Alerts. It fully automates accident notification to improve response time for driver assistance and expedite the claims process. These are just a few ways you can help your drivers practice good parking lot and backing behaviors. After all, they are your brand ambassadors in the field. For more about how CalAmp can help you manage your commercial fleet, visit our page here. If you would like more information on our collision reporting services, visit our CrashBoxx page here. The impact of driver behavior on your fleet vehicles and company brand.